WASHINGTON — The Pier Oyster Bar and Grill in Edgewater, Maryland, was packed with family, coworkers and others who wanted to support Sunday’s fundraiser for a Prince George’s County firefighter battling stage 4 colon cancer. Jesse McCullough, who is assigned to the Landover Hills Fire and EMS Station, had been diagnosed with colon cancer in January 2017. He is the same firefighter who rescued a dog from freezing waters in Hyattsville, Maryland, in December 2017. McCullough attended the event and tells WTOP that a few things keep him in a positive frame of mind. He says the biggest thing that helped him after his diagnosis is the fact that he gets to tell his wife and daughters he loves them every day. Maryland Gov. 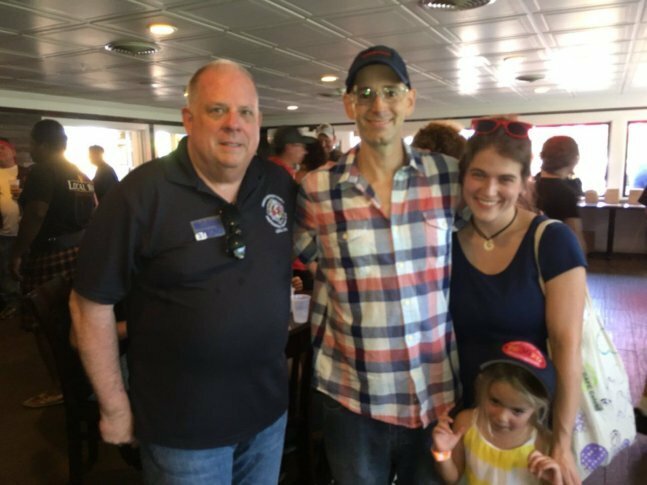 Larry Hogan, who dealt with his own cancer battle, attended Sunday’s fundraiser. “I’ve gone through a similar thing myself with cancer for 18 months, and I just wanted to be here to give him some emotional support,” Hogan told WTOP. Lt. Erica Hasan told NBC Washington that McCullough is undergoing chemo and that his cancer has progressed. Hasan and other colleagues hope the fundraiser helps defray some of McCullough’s treatment expenses and to lift some of the financial burden from his family. There’s also a GoFundMe page seeking to raise $35,000 for his treatment. McCullough’s diagnosis isn’t a lone occurrence among firefighters. Occupational cancer deaths claim these first responders more than any other firefighter line-of-duty deaths across the nation, according to the International Association of Firefighters. A large percentage of names added to the IAFF’s national Firefighters Memorial since 2002, about 60 percent, have been diagnosed with work-related cancers. A study of 30,000 firefighters in Chicago, Philadelphia and San Francisco found that firefighters are at an increased risk for certain cancers than most of the U.S. population. There’s now funding to create a database to track firefighter cancer cases nationwide. Maryland Sen. Chris Van Hollen has announced passage of $2 million that will be used to help fund the Firefighter Cancer Registry Act. “That’s going to be a big help, because … we just haven’t had the data to go to and to show the significance,” Prince George’s County Fire and EMS Chief Benjamin Barksdale said to NBC Washington. “Firefighters in Maryland and across the country put their lives on the line every day to protect our communities,” Sen. Van Hollen said in a news release.